The Xbox Team has recently introduced the new Xbox Live Rewards. We’ve rethought what it means to be rewarded. We’ve listened to your feedback and added new rewards into the mix. And now we couldn’t be more excited to share it with you – our most dedicated Xbox fans. 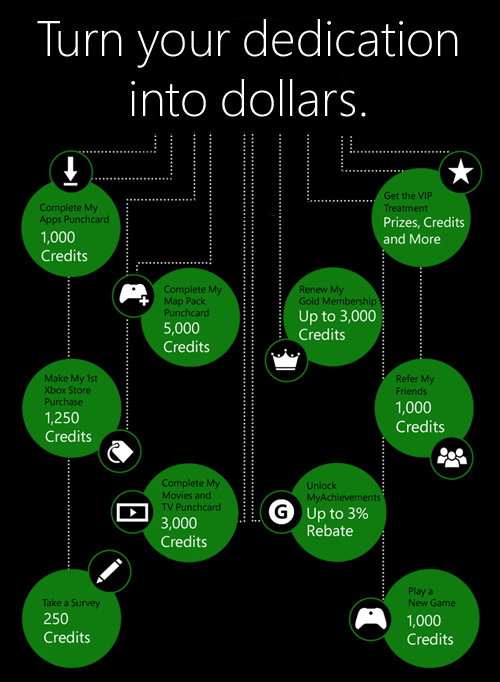 Earn Rewards Credits, turn them into cash, spend them at the Xbox Stores. You achieved, now receive more! Introducing a new MyAchievements VIP tier for our most dedicated gamers. Get paid to play! Introducing a new reward for playing the latest games. And keep earning by renewing your Gold membership, spending at the Xbox Stores, referring your friends, taking surveys and more! Microsoft Gifting Free Xbox One Consoles and Games to Loyal Xbox Fans? Last revised by: WP7 Connect on September 5, 2013.